In today’s post, I want to talk to you about how to communicate with your MLM team and distributors. 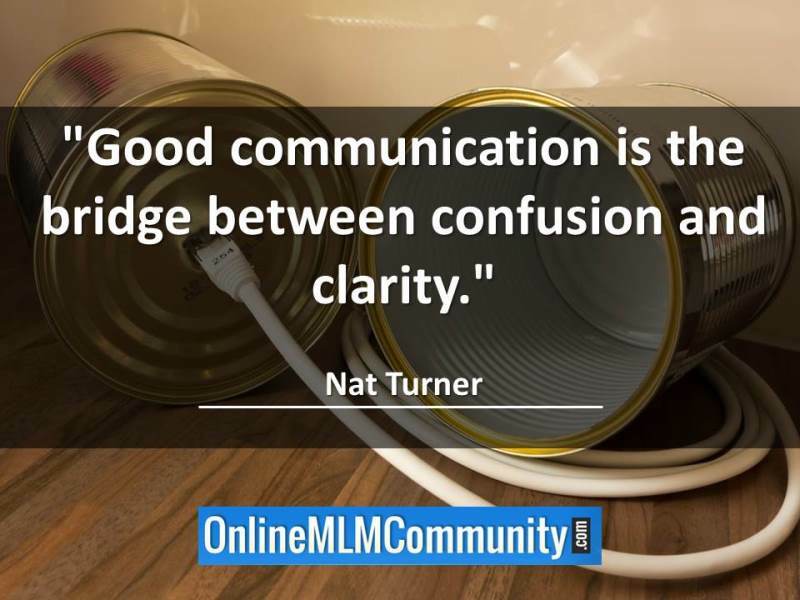 I honestly believe that good communication is vitally important if you want to succeed in network marketing (or any other business). People want and need to be informed as to what is going on in the business. In addition, people want to feel a sense of belonging. They want to feel important and know that you care about them on a human level. Relationships are the key to long-term success in network marketing. The only way to keep a strong relationship is with constant communication. To communicate effectively with your team members, you need good communication skills and a solid game plan. You must be proactive, see things from the other person’s point of view, and make the other person feel important. It won’t happen by accident. What you will see below are 8 simple tips you can follow to communicate with your MLM team effectively. 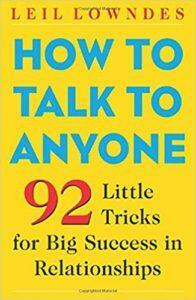 I hope you will consider each tip, and look for ways to improve your own communication skills. The first thing you should realize is that whenever you are feeling down or depressed you should call your upline, not your downline. Never share your frustrations or disappointments with ANYONE on your downline team. EVER. They already have their own problems and struggles and don’t need to know about your problems. If you share your problems with your downline, you will plant seeds of doubt in their mind about the business. On the other hand, your upline and sponsor are there to coach you and support you and help you work through your own challenges. Just remember, when you are feeling down, go up and when your are feeling up, go down! When you recruit someone into the business you want to tell them right up front how you like to communicate. Let them know your favorite ways to communicate, the best way to reach you and the best time to call. Let them know if and when you will call them. Let them know what your protocol is for answering questions. For example, I tell everyone I sponsor that it’s their job to call me when they have a question or need help. I tell my team that they won’t hear from me much and that if they want to talk, just give me a call. Figure out what works best for you and let your team know what they should do. When you look at your downline report you will be able to tell who is active in the business and who isn’t. Typically, no more than five to ten percent of your team is active. Make sure that you communicate with everyone who is active and doing something to grow their business. In other words, communicate often with the folks who are actively sponsoring new customers and distributors into the business. Stay in touch with these folks at least once a week. Send them a handwritten note, an email or give them a call. Let them know you are there to support and help them as needed. I believe you should send out a weekly email or voice broadcast to your entire team every week. Send out any new business updates, training tips, thoughts for the week, contests and incentives, specials, etc. Keep everyone abreast as to what is going on in the company. I send an email to my entire team every Monday, Wednesday and Friday. I am a big fan of having a team newsletter that you send out in the mail once each month. An email newsletter won’t cut it. I know there is a cost associated with it and it takes a little time to do, but I think it is time and money well spent. What’s great about a mailed newsletter is you can make sure everyone on your team gets the SAME information. Nothing gets distorted or lost in translation. I would send your newsletter to all of your personally sponsored people and all of your serious people. You can’t call hundreds or thousands of people yourself each month. There isn’t enough time in the day to do that. Save those one-on-one calls for your top leaders and personally sponsored people. Whenever possible, leverage email, voice broadcast or other technology to communicate with your entire team at once, so you can work smart. For example, there are voicemail services you can use, such as Communikate. Each person on your team can subscribe to the voicemail service and you can share one message with everyone who has subscribed to the service, all at once, with the click of a button. At least one a month, or every other month, you want to get your team together to socialize and spend time together. Nothing beats face-to-face interaction and one-on-one communication. This could be a home party, event at your house, a regional event or company event. You could even take a team member out for lunch. This is where you can shake hands, give hugs, and form deeper connections with people. This really is a relationship business and you want to leverage face-to-face interaction whenever you can. This might just be the most important tip on this list. As a leader, you need to be accessible and respond to messages promptly. Never take more than 24 hours to return a call or email. Don’t leave people hanging. 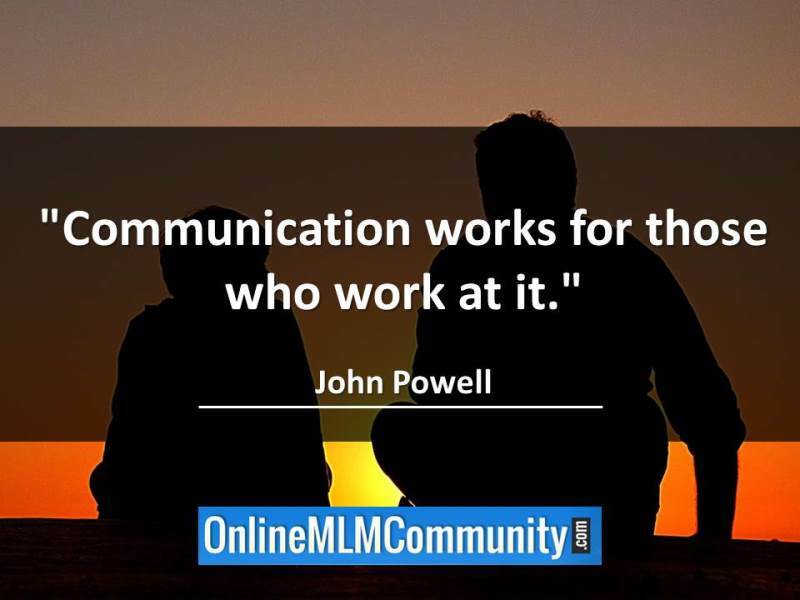 The bottom line is that good communication is very important if you want to succeed in network marketing, or anything else in life. You must know how to express your ideas clearly and you must have a game-plan to communicate with your MLM team. What are your thoughts? What are your best tips to communicate with your MLM team and distributors effectively? Leave a comment below to let me know what you think. I am in firm agreement with contacting your active members weekly. It shows you are there for them and they will respect you for it. I would also say that from time to time you should probably give inactive members a call and just ask if anything is wrong. Let them know that you have noticed they have not been active and you may want to ask if there is anything you can do to help.Now, of course you don’t want to babysit them, but maybe with just the knowledge that you care, they will fire up and get active. Just my opinion. It is truly valuable for you and your business to thoroughly explain what people can expect in every aspect of the company once they choose to get involved. Disappointment is caused by the gap between reality and expectation, so being clear is the key to omitting disappointment. Also, this eliminates the “you never told me” or “I did not know” excuses that people often give when they are underachieving. Communication is so very, very important. As I reread this entire post, I just wanted to share something that I feel could be quite beneficial in the communication with a whole network marketing team. I think it is wise to have a complete team meeting from time to time. This way members can share what is and isn’t working for them. Most of the time, it can be quite difficult to arrange a location where everyone can meet. There is a program called Go To Meeting where everyone can all meet via the internet. Yes, having local team meetings is a very important aspect of network marketing. Really good suggestion here. I am glad I came back to re-read this post and get this tip. It is good to have a meeting where everyone is able to voice their concerns and frustrations. It lets them know that you care about what they have to say and it lets you know the areas that need improvement. Then as a group you all can brainstorm together and figure out some ways to help resolve the issues that were addressed. Two heads are better than one, and a dozen heads are better than two right? Hello Chuck, What a great article! Power packed full of tips on how to communicate with your team. I do agree with what Greg stated above #1 should be #1. You do need to have that positive mindset and if you don’t well then DO NOT spread this to your team. As you have stated they have enough on their plates. I guess I never gave much thought to reaching to my upline LOL I just pick up a book or put in a mindset tape of some sort and get back on track. I am not one to put my troubles on others, but It does make sense. The #1 tip you mentioned is also first in my opinion. Negative up and positive down. It seems like common sense, but many network marketers don’t heed it. Great post Chuck.